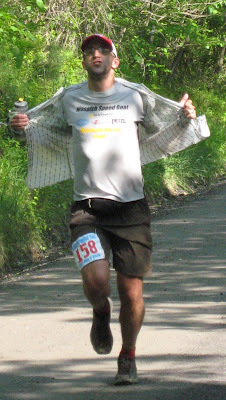 This entry was posted in Speedgoat Updates on May 26, 2008 by WSG. This entry was posted in Industry News on May 22, 2008 by WSG. It’s that time of year and the snow is melting fast except the fresh foot powder we just got! This year’s Speedgoat 50k is ready to rock through a new section called Mary Ellen’s gulch, west of Mineral Basin. Karl took a run there last fall and found a faint single track that takes you over the ridge into some new terrain, this is real goat country! So sharpen your hooves and get ready to run one of the toughest 50k trail race there is. Snowbird’s Cliff Lodge is ready to take reservations for rooms @ $89.00 per night, just mention you’re running the “Speedgoat 50k” July 26th. 1-800-232-9542. Cross Mt. Baldy with the crew from Black Diamond there to assist with ropes. Run through Snowbird’s skier tunnel 9000 feet above sea level. This is a spectator’s race, crews gets 2 tram passes to watch their runners from 11,000 feet above sea level. Snowbird has an array of summer activities for families and crews. Lodging available at the starting line. Entire race takes place between 8,000 and 11,000 feet. Vertical gain over 10,000 feet. This entry was posted in Industry News on May 13, 2008 by WSG. We are excited to have the outdoor company Patagonia on board, take a look at the nice trail running cloths these guys has to offer. Patagonia clothing company. Patagonia is a designer of outdoor clothing and gear. We make organic cotton clothing, sportswear, travel clothing, technical fleece, Synchilla; fleece, Capilene; underwear. We also have children’s clothing, kids; apparel & baby clothes. Our online store offers women’s and men’s outdoor clothing, including jackets, outerwear, gear, fleece, underwear, sportswear, shells, pants, bibs, vests, pullovers, hats, gloves – waterproof, windproof, & insulated for skiing, snowboarding, camping, climbing, hiking, travel and other outdoor sports. This entry was posted in Speedgoat Updates on May 7, 2008 by WSG. Congrats to top nannies Olga and Kelly who both finished strong last weekend at the Miwok 100k! 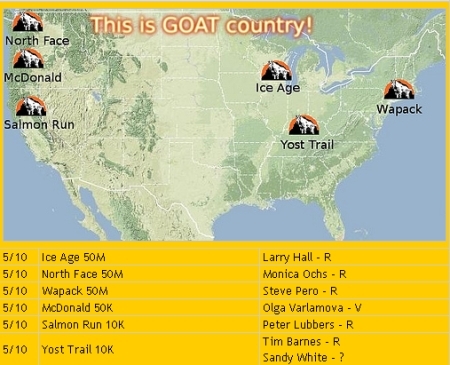 As the snow melts race schedules are picking up with seven goats traveling all over the country enjoy the trails! Stay tuned to see their results and stories! Speed Goat Coupon Now Available! This entry was posted in Industry News Training Tips on May 6, 2008 by WSG. Protein molecules range from the long, insoluble fibers that make up connective tissue and hair to the compact, soluble globules that can pass through cell membranes and set off metabolic reactions. Humans are made up of an estimated 30,000 different proteins, of which only about 2 percent have been adequately described. Proteins in the diet serve primarily to build and maintain cells, but their chemical breakdown also provides energy, yielding approximately 4 calories per gram, similar to carbohydrates. Proteins are composed of about 20 different amino acids which in turn, are composed of carbon, hydrogen, oxygen, nitrogen, and sometimes sulfur. In a protein molecule, these acids form peptide bonds between amino and carboxyl (COOH) groups in long strands (polypeptide chains). The numerous combinations, in which the acids line up, and the helical and globular shapes into which the strands coil, help to explain the great diversity of tasks that proteins perform in living matter. This entry was posted in Speedgoat Updates on May 5, 2008 by WSG. CamelBak will end up looking like the smartest guys in the room with their non-BPA bottles if the Canadian government tags the Nalgenes as a toxic chemical. Some undercover scientist leaked to the press that the Canadian government is prepared to let the world know that camping and baby bottles are slowly poisoning them. How many years of poisoning have you expreienced? The public and industry will have 60 days to comment on the designation once it is released, setting into motion a two-year process that could lead to a partial or complete ban on food-related uses of plastics made using B.P.A. When they say “public” they mean Canada, but I stopped using my Nalgene years ago—to dangerous. Now I just use it as an ashtray. Choose your hydration products with caution!